Associations with neurological disorders such as Parkinson's disease (PD), narcolepsy, and multisystem atrophy were investigated along with non-motor manifestations such as cognitive, autonomic and cardiac, and sleep apnea. Level A - Recommended-Evidence level 1. Level B - Suggested-Evidence level 1-4 fewer studies or expert consensus. The PSG electroencephalogram (EEG) characteristics of REM sleep observed are a manifestation of the ascending cholinergic activation that promotes EEG desynchrony. The descending cholinergic projections produced muscle atonia via activation of neurons in the pontine reticular formation (PRF) and ventral medial medulla, which in turn project into the spinal cord. Glycine is the prominent inhibitory neurotransmitter that inhibits the spinal motor neuron and thus produces the muscle atonia that is characteristic of REM sleep. Orexin provides the stability to NREM/REM flip-flop mechanism, and loss of these hypocretin/orexin neurons can manifest as hypersomnia with REM intrusions as seen in narcolepsy. Despite apparent unconsciousness, the brain is readily responsive to the environment during REM sleep. Complex auditory sound processing, similar to wakefulness, occurs during REM sleep, and there is a lower threshold for reversibility to wakefulness with auditory stimuli compared to NREM. Further, it has been demonstrated that dream mentation can be altered by verbal stimulation. Anecdotal expert consensus exists on intervention measures to prevent falls in RBD including placing a mattress on the floor, padding corners of furniture, window protection, and removing potentially dangerous objects from the bedroom. A customized bed alarm pacifying patients with a calming phrase prevented falls in 4 medically refractory RBD patients during vigorous dream enactment behavior. Pre-treatment: 5 serious events, 80 minor events, and 193 near events were observed in over 66 patient-months (4.21events/pt-mo). Post-treatment improvement was noted after a follow up period of 63 pt-months with a marked reduction in events (0.05 event/pt-mo). The study has been summarized in [Table 1]. In a survey-based study (n = 45), 25 patients received melatonin, 18 were administered CNZP, and two received both as initial treatment. Before treatment, 27 patients (60%) reported an RBD-associated injury. Median dosages were 6 mg for melatonin and 0.5 mg for CNZP. RBD visual analog scale (VAS) ratings were significantly improved following both treatments. Melatonin-treated patients reported less frequent adverse effects than those treated with CNZP  [Table 2]. Meta-analysis of 22 studies included 16 case series, ,,,,,,,,,,,,,,, six case reports, ,,,,, and one community  sample with a total of 339 subjects, of whom 306 were noted to have complete (249) or partial (57) treatment response to CNZP. The clinical efficacy noted was 80% at Minnesota Regional Sleep Disorders Center. The dosage ranged 0.25-4.0 mg administered 30 minutes prior to bedtime. Women tended to require higher dosage than men. Sustained CNZP efficacy in 89.5% of 57 treated patients. No dose escalation was reported. CNZP also decreased the occurrence of SRI caused by RBD. Polysomnography (PSG) variables on patients that were drug-free RBD patients and on CNZP treatment n = 57 patients with 42 untreated iRBD patients, 15 iRBD patients on CNZP (0.5-1 mg) at bedtime. iRBD+Clo patients showed a lower rate of sleep stage shifts, improved sleep efficiency, and lower percentage of wakefulness after sleep onset observed. The CGI scale improved after treatment. No evident common trend was observed for RBD severity scale (RBDSS) or Atonia Index. Side effects of CNZP included: Sedation, impotence, morning motor incoordination, confusion, memory dysfunction, no reported instance of drug abuse, risk of confusion, or falls. The mechanism of melatonin is unclear; it is suggested that it restores RBD-related desychronization of the circadian rhythms. One case report,  two open-label prospective case series, ,[ 35] two retrospective case series  (n = 38). Dose: 3-12 mg at bedtime. PSG showed statistically significant decrease in number of R epochs without atonia ,[ 37] and in movement time in R.  Successfully treated patients included those with synucleinopathies including DLB, PD, and MSA memory problems and sleep-disordered breathing. , Side effects include morning headache, sleepiness, and delusions/hallucinations. Reviewed two papers, six cases, four were associated with neurodegenerative disorders. Result: Four patients responded at doses between 10 mg and 15 mg, , and two patients failed to respond to donepezil. The following medications were considered for treatment of RBD with limited evidence: Zopiclone, benzodiazepines other than CNZP, Yi-Gan San, desipramine, clozapine, carbamazepine, and sodium oxybate  [Table 3]. RBD might protect against obstructive sleep apnea. Loss of atonia in skeletal muscle in RBD patients could lead to lower severity of OSA with shorter apneas and hypopneas; serotonergic enhancers such as paroxetine, mirtazapine, and glycinergic antagonists could alleviate the severity of OSA by increasing EMG activity. España RA, Scammell TE. Sleep neurobiology for the clinician. Sleep 2004;27:811-20. Aurora RN, Zak RS, Maganti RK, Auerbach SH, Casey KR, Chowdhuri S, et al. Standards of Practice Committee, American Academy of Sleep Medicine. Best practice guide for the treatment of REM Sleep Behavior Disorder (RBD). J Clin Sleep Med 2010;6:85-95. Boeve BF, Silber MH, Saper CB, Ferman TJ, Dickson DW, Parisi JE, et al. Pathophysiology of REM sleep behavior disorder and relevance to neurodegenerative disease. Brain 2007;130:2770-88. Phillips B, Ball C, Sackett D, et al. Oxford Centre for Evidence-Based Medicine - Levels of Evidence; 2009. www.cebm.net/levels_of_evidence.asp. Olson EJ, Boeve BF, Silber MH. Rapid eye movement sleep behavior disorder: Demographic, clinical and laboratory findings in 93 cases. Brain 2000;123:331-9. Boeve BF, Silber MH, Ferman TJ, Kokmen E, Smith GE, Ivnik RJ, et al. REM sleep behavior disorder and degenerative dementia: An association likely reflecting Lewy body disease. Neurology 1998;51:363-70. Wing YK, Lam SP, Li SX, Yu MW, Fong SY, Tsoh JM, et al. REM sleep behaviour disorder in Hong Kong Chinese: Clinical outcome and gender comparison. J Neurol Neurosurg Psychiatry 2008;79:1415-6. Schenck CH, Mahowald MW. 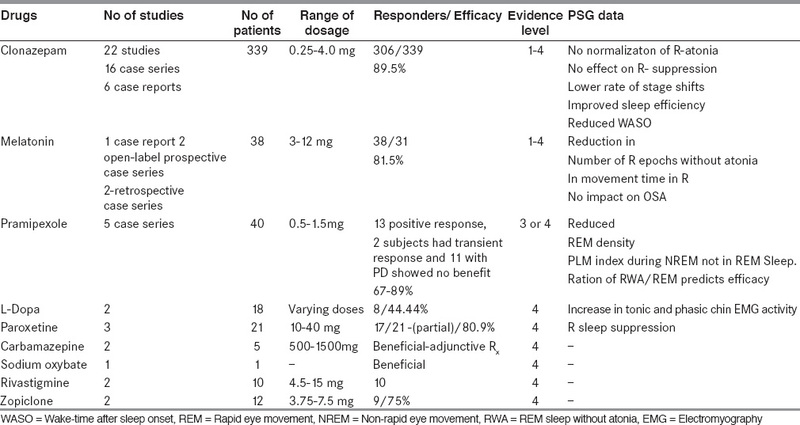 A polysomnographic, neurologic, psychiatric, and clinical outcome report on 70 consecutive cases with REM sleep behavior disorder (RBD): Sustained clonazepam efficacy in 89.5% of 57 treated patients. Clev Clin J Med 1990;57:9-S23. Chiu HF, Wing YK, Lam LC, Li SW, Lum CM, Leung T, et al. Sleep-related injury in the elderly - An epidemiological study in Hong Kong. Sleep 2000;23:513-7. Takahara M, Nittono H, Hori T. Effect of voluntary attention on auditory processing during REM sleep. Sleep 2006;29:975-82. Howell MJ, Arneson PA, Schenck CH. A novel therapy for REM sleep behavior disorder (RBD). J Clin Sleep Med 2011;7:639-44A. McCarter SJ, Boswell CL, St Louis EK, Dueffert LG, Slocumb N, Boeve BF, et al. Treatment outcomes in REM sleep behavior disorder. Sleep Med 2013;14:237-42. Chiu HF, Wing YK, Chung DW, Ho CK. REM sleep behavior disorder in the elderly. Int J Geriat Psychiatry 1997;12:888-91. Iranzo A, Molinuevo JL, Santamaria J, Serradell M, Martí MJ, Valldeoriola F, et al. Rapid-eye movement sleep behaviour disorder as an early marker for a neurodegenerative disorder: A descriptive study. Lancet Neurol 2006;5:572-7. Husain A, Miller PP, Carwile ST. REM sleep behavior disorder: Potential relationship to post-traumatic stress disorder. J Clin Neurophysiol 2001;18:148-57. Lapierre O, Montplaisir J. Polysomnographic features of REM sleep behavior disorder: Development of a scoring method. Neurology 1992;42:1371-4. Mahowald MW, Schenck CH. Status dissociates - a perspective on states of being. Sleep 1991;69-79. Manni R, Terzaghi M. REM behavior disorder associated with epileptic seizures. Neurology 2005;64:883-4. Massironi G, Galluzzi S, Frisoni GB. Drug treatment of REM sleep behavior disorders in dementia with Lewy bodies. Int Psychogeriatr 2003;15:377-83. Schenck CH, Boyd JL, Mahowald MW. A parasomnia overlap disorder involving sleepwalking, sleep terrors, and REM sleep behavior disorder in 33 polysomnographically confirmed cases. Sleep 1997;20:972-81. Schenck CH, Hurwitz TD, Mahowald MW. REM sleep behaviour disorder: An update on a series of 96 patients and a review of the world literature. J Sleep Res 1993;2:224-31. Schenck CH, Mahowald MW. Injurious sleep behavior disorders (parasomnias) affecting patients on intensive care units. Intensive Care Med 1991;17:219-24. Bokey K. Conversion disorder revisited: Severe parasomnia discovered. Aust N Z J Psychiatry 1993;27:694-8. Kimura K, Tachibana N, Kohyama J, Otsuka Y, Fukazawa S, Waki R. A discrete pontine ischemic lesion could cause REM sleep behavior disorder. Neurology 2000;55:894-5. Kumru H, Santamaria J, Tolosa E, Valldeoriola F, Muñoz E, Marti MJ, et al. Rapid eye movement sleep behavior disorder in parkinsonism with parkin mutations. Ann Neurol 2004;56:599-603. Morfis L, Schwartz RS, Cistulli PA. REM sleep behaviour disorder: A treatable cause of falls in elderly people. Age Ageing 1997;26:43-44. Provini F, Vetrugno R, Pastorelli F, Lombardi C, Plazzi G, Marliani AF, et al. Status dissociatus after surgery for tegmental ponto-mesencephalic cavernoma: A state-dependent disorder of motor control during sleep. Mov Disord 2004;19:719-23. Thomas M, Moore K. Falling asleep. Age Ageing 2004;33:636-7. Personal communication from Schenck CH. Kunz D, Bes F. Melatonin effects in a patient with severe REM sleep behavior disorder: Case report and theoretical considerations. Neuropsychobiology 1997;36:211-4. Kunz D, Bes F. Melatonin as a therapy in REM sleep behavior disorder patients: An open-labeled pilot study on the possible influence of melatonin on REM-sleep regulation. Mov Disord 1999;14:507-11. Takeuchi N, Uchimura N, Hashizume Y, Mukai M, Etoh Y, Yamamoto K, et al. Melatonin therapy for REM sleep behavior disorder. Psychiatry Clin Neurosci 2001;55:267-9. Boeve BF, Silber MH, Ferman TJ. Melatonin for treatment of REM sleep behavior disorder in neurologic disorders: Results in 14 patients. Sleep Med 2003;4:281-4. Fantini ML, Gagnon JF, Filipini D, Montplaisir J. The effects of pramipexole in REM sleep behavior disorder. Neurology 2003;61:1418-20. Schmidt MH, Koshal VB, Schmidt HS. Use of pramipexole in REM sleep behavior disorder: Results from a case series. Sleep Med 2006;7:418-23. Kumru H, Iranzo A, Carrasco E, Valldeoriola F, Marti MJ, Santamaria J, et al. Lack of effects of pramipexole on REM sleep behavior disorder in Parkinson disease. Sleep 2008;31:1418-21. Sasai T, Matsuura M, Inoue Y. Factors associated with the effect of pramipexole on symptoms of idiopathic REM sleep behavior disorder. Parkinsonism Relat Disord 2013;19:153-7. Sasai T, Inoue Y, Matsuura M. Effectiveness of pramipexole, a dopamine agonist, on rapid eye movement sleep behavior disorder. Tohoku J Exp Med 2012;226:177-81. Rye DB. Contributions of the pedunculopontine region to normal and altered REM sleep. Sleep 1997;20:757-88. Moraes WA, Poyares DR, Guilleminault C, Ramos LR, Bertolucci PH, Tufik S. The effect of donepezil on sleep and REM sleep EEG in patients with Alzheimer disease: A double-blind placebo-controlled study. Sleep 2006;29:199-205. Ringman JM, Simmons JH. Treatment of REM sleep behavior disorder with donepezil: A report of three cases. Neurology 2000;55:870-1. Di Giacopo R, Fasano A, Quaranta D, Della Marca G, Bove F, Bentivoglio AR. Rivastigmine as alternative treatment for refractory REM behavior disorder in Parkinson′s disease. Mov Disord 2012;27:559-61. Treglia G, Cocciolillo F, Stefanelli A, Cason E, Giordano A. Usefulness of MIBG scintigraphy in idiopathic REM sleep behavior disorder: A systematic review. Res Rep Nucl Med 2011;2011:1-7. Huang J, Zhang J, Lam SP, Li SX, Ho CK, Lam V, et al. Amelioration of obstructive sleep apnea in REM sleep behavior disorder: Implications for the neuromuscular control of OSA. Sleep 2011;34:909-15. Ferri R, Zucconi M, Marelli S, Plazzi G, Schenck CH, Ferini-Strambi L. Effects of long-term use of clonazepam on nonrapid eye movement sleep patterns in rapid eye movement sleep behavior disorder. Sleep Med 2013;14:399-406. Teman P, Tippman-Peikert M, Silber MH, Slocumb NL, Robert Auger R. Idiopathic rapid-eye movement sleep disorder: Associations with antidepressants, psychiatric diagnoses, and other factors, in relation to age of onset. Sleep Med 2009;10:60-5. Winkelman JW, James L. Serotonergic antidepressants are associated with REM sleep without atonia. Sleep 2004;27:317-21. Iranzo A, Santamaria J. Bisoprolol-induced rapid eye movement sleep behavior disorder. Am J Med 1999;107:390-2. Silber MH. REM sleep behavior disorder associated with barbiturate withdrawal. Sleep Res 1996;25:371. Postuma RB, Gagnon JF, Montplaisir JY. REM Sleep Behavior Disorder and Prodromal Neurodegeneration - Where Are We Headed? Tremor Other Hyperkinet Mov (N Y) 2013;3.